Pi Mai, also known as Songkran, Lao New Year, and the the Water Festival, officially spans three days — the final day of the year, the “Day of No Day,” and the first day of the new year. All three days are considered national holidays, so when Pi Mai fell on a weekend this year, it meant that nearly everyone in the country would have a five day weekend! A lot of people we know chose to take advantage of the long weekend and take an entire week off, traveling outside of the country and even out of the region. In fact, a lot of people in Vientiane simply didn’t bother showing up to work the Monday before the holiday (that officially started on Thursday and went through Monday). Shops shuttered, services halted, and the city essentially came to a standstill, but for the drinking, the water throwing, and the music…but we’ll get to that. We toyed with the idea of finally heading to the beach in order to flee the madness. That would’ve meant Thailand, but it was Songkran there as well — and most certainly crazier — so that wasn’t going to be an option. Besides, we wanted to be able to experience a bit of the infamous Lao holiday at least once while living in Laos, but a Pi Mai-lite sounded appealing to us, given the Mister’s bedtime and inability to defend himself against water attacks. Five days meant that we could visit somewhere we typically didn’t get to visit on our own, but we didn’t necessarily want to bother with flying. A road trip would be nice. So where to go? Lori could take a work vehicle essentially anywhere in Laos in a 350km radius, which made the decision actually pretty easy — Konglor Village and Thakhek! Roadside scenery along Road 8, between Vieng Kham and Na Hin. Now, those of you who have been following this blog for a while may remember a certain motorbiking adventure we did in Laos in 2012. Halfway through Laos, we procured a plastic little motorbike in Thakhek and set off on a 300-mile loop through some of Laos’ most challenging and remote roads at the time. 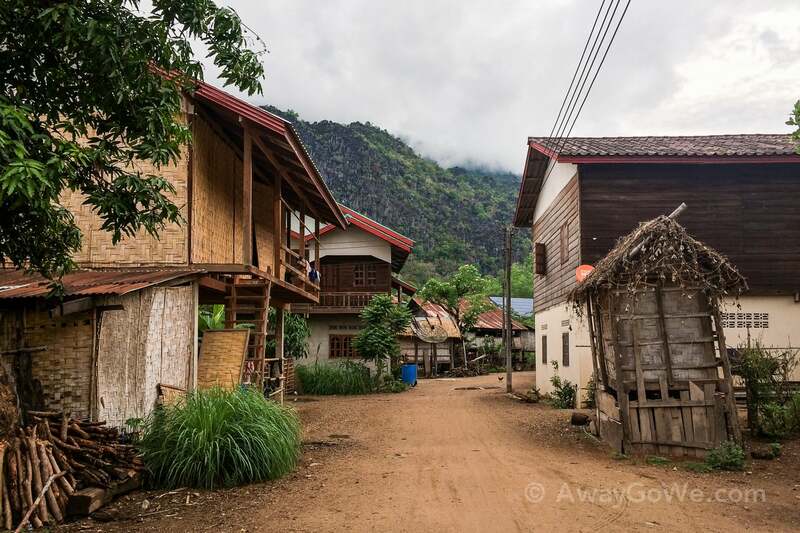 The original trip took us four days, including an extended stay in Konglor Village to take a longtail boat through a 7km cave on a subterranean river. The entire adventure was one of the highlights of our six-month honeymoon backpacking trip around Asia and traveling through the region solidified our desire to return to Laos for an extended period of time. For Pi Mai 2017, we’ll spend two nights in Konglor village, drive ‘The Loop’ in reverse on the ‘Day of No Day,’ and spend the last two nights in Thakhek, the charming old colonial capital of Khammouane Province. Our travel day south from Vientiane was stormy — reminiscent of our last little road trip with friends when Noe decided to catch pneumonia. Fortunately, this trip was far less dramatic — though Noe did have a bit of congestion that affected his sleep the first night, which is always loads of fun in a guesthouse. 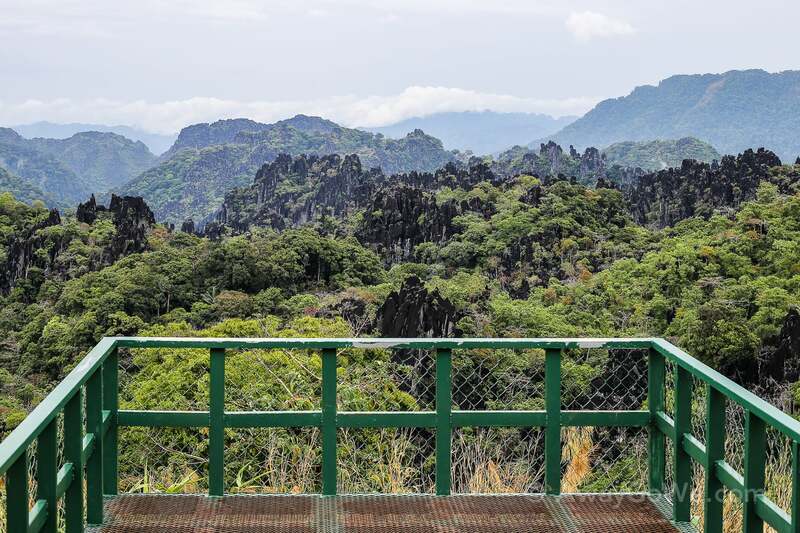 At the top of the mountain pass between Vieng Kham and Na Hin is this awesome viewpoint. We’d actually been looking forward to stopping here all day. In 2012, the viewpoint was a welcome respite after a harrowing ride up the mountain on a tiny motorbike, dodging big trucks and pushing the 110cc motor to the limit. In 2012, we were the only ones for miles around, but for the occasional lumbering supply truck coming over the pass every several minutes. In 2017, a different story. 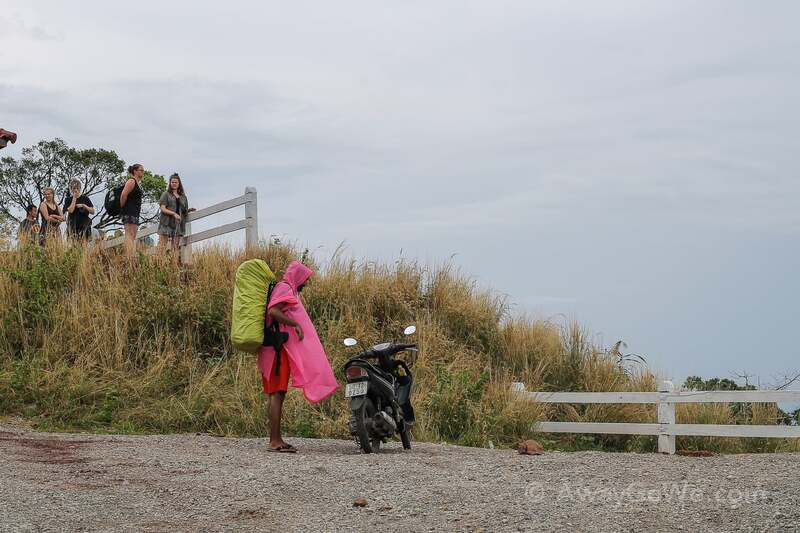 In our short time at the viewpoint, a half dozen Lao families, a giant bus of falang tourists and a gaggle of falang motorbikers stopped to take in the surroundings. Granted, this is a holiday weekend, so it’s tough to compare, but a half day into our journey back in time and we’re already getting the feeling that much has changed. Getting back into the pickup, we see a truck full of Pi Mai revelers undoubtedly on their way to some celebration that evening or weekend. It was not the first of the day, and it definitely wasn’t the last. I can’t even begin to count how many of these truck-fulls we passed on our way from Vientiane to Konglor. I had remembered these two bridges from two years prior (the one above and one later in the post) — kind of hard to forget. The first that you cross on your way to Konglor has a loose, rickety plank deck — lots of fun on a squirrely little motorbike, and even more fun in the rain with muddy tires, I’d imagine. The deck of the second is constructed of concrete planks which are far more appealing to ride over. As you might have noticed in the photo above, the bridge has got a few horizontal planks missing, and you can see right through, so…yeah…you really want to stay on the tracks — particularly in a heavy pickup. Fortunately, Lori’s had lots of practice driving over these sorts of bridges in Laos and Belize, so Noe and I decided to save putting on our life vests for the really gnarly bridges at some point. But really, danger is all relative. If the rickety bridges don’t kill, the village militia probably will. Where are all the adults, you ask? If we’re not careful, I think we’re going to find out pretty fast. Now’s as good a time as any to talk about the water aspect of Pi Mai. Often dubbed, the ‘Water Festival’ by foreigners, water is a significant aspect of the Lao New Year. During Pi Mai, families visit their local temple to ‘wash’ the Buddha images. I’ll talk more about what that means in a future post, but essentially people pour water on Buddha statues. Additionally, Pi Mai traditionally falls in the hottest time of year in Laos. So, with everybody walking around with loads of water on the hottest days of the year, I’m sure it didn’t take long before that water was being used to wash more than just figurines. It seems that every shop in Vientiane this past week was selling super soakers, kiddie pools, buckets and hoses, and we’ve already seen them in action a few times on our drive. We’ve been told numerous times that if we are in Laos during Pi Mai, we will get wet — it’s not a matter of if, but when and where. One of my favorite stretches of The Loop — I’ve got great memories of rolling the throttle on and sitting back on a hot day, with the wind blowing and the spectacular scenery spreading out all around us. Nothing like beautiful clean tarmac after two full days of rugged and exhausting riding. While the feeling wasn’t quite the same this time around, it was still great to be back — and to be honest, it was a lot easier for the two of us to take in the scenery, riding high up in a pickup and without a helmet limiting your field of vision. In all, it took us about seven hours to reach Konglor from Vientiane, with a couple of delays due to weather, poor roads, and Noe. It was about 4:30p when we rolled into the village, and was pleasantly quiet for being the first official day of the holiday weekend. We drove right by the guesthouse we stayed at in 2012 and pulled into Chantha House just down the road. What immediately struck us about the village was the sorry state of the main road running through town. Four years prior, this is what the road looked like (above). And four years later, the same stretch of road about 100m farther into town. I’ve seen a lot of roads in various parts of the world come and go. I’ve seen villagers get really excited when fresh, black, beautiful tarmac is laid, and I’ve returned in some cases only a handful of years to see it worse than it was before. Rule #1 of development — it doesn’t do any good to sink a bunch of money into roads, bridges, wells, latrines, schools, etc., if there’s no longterm plan for maintaining those things into the future. But we do it over and over and over. Keeps the foreign contractors and Chinese employed, I guess. It’s hard to argue with that advertising display. Actually, the only reason we’re staying here is because it is the only place in town with A/C…or so we thought. Turns out, a few other places in town also have A/C. So, have we grown soft over the past few years? Perhaps. Certainly if you look at our 2012 travels and given that we stayed in one guesthouse with A/C over the course of three weeks and about a dozen guesthouses in Laos. But that was in a cooler time of year and we weren’t traveling with the Mister, who gets extra cranky when he’s too hot or too cold…wah, wah, wah is what I have to say to that. Chantha House is a perfectly adequate place to stay in Konglor, particularly considering what the options were during our last visit. Our memories of our previous lodging in Konglor in 2012 consist primarily of the walls of our room being made of two layers of woven thatch, through which you could hear, smell and even see your neighbor. We know this because our neighbor spent the entire night chain smoking and talking very loudly on the phone with his light on, all of which made it right through the thatch and into our room. A flat sheet would have been a more effective divider, but anyone who’s spent time in Laos knows that’s just crazy because no one uses flat sheets here — for bedding or any other purpose. The main road through town was buzzing with activity — primarily pickup after pickup carrying area residents to an unknown fate…unknown to us, at least. We had some time before dinner, so decided to take an evening stroll through the village, which was uncannily similar to how we remember it. Sometimes I have to remind myself that it’s only been a little over four years since we were last in some of these places. But in a country like Laos in this day and age with the pace of development, four years might as well be forty in some cases. It’s nice to see some things haven’t changed so fast. Konglor is a rural community, and poor by Western standards. But this village is far from a squatter’s camp and people are not living in destitution here. For the most part, people live in solid, proper houses, have electricity and access to clean running water. They have a good deal of food security and safety and security in general. Life seems good here, and there is a big part of me that envies the locals — tight-knit community living in close proximity to one another with access to simple, yet honest livelihoods opportunity, all in this incredibly beautiful and fertile valley. And lately, the cave at the end of town has brought even more economic opportunities. Yet, I’m sure the lure of the brand-new 4×4 pickup, the flashy gadgets and parental bragging rights have sent many of the best and the brightest of Konglor’s youth in search of more lucrative opportunities in Vientiane, Bangkok or farther places. And that’s their prerogative. But I can’t help but feel heartsick, having worked with and researched youth over several years, seeing where this path ultimately leads in such places — trading in the heart and soul of their deeply-rooted communities for the hollow materialism of Western success. I know this may sound hard to believe, but for all our careful note taking and copious photo taking, there are many places in our travels that fall through the cracks. The name of the place we had dinner in Konglor four years ago falls into that category, and as such has been a mystery…until today. We were walking back to our hotel and noticed this place off the road. Both of us were having a vague memory of the place we had dinner at during our last trip. When we rounded the corner, it was confirmed. Kounme! Granted, there are only three other restaurants in town (including the guesthouse we’re staying at). But the fact that the place was still here and not much different was a fun surprise. Noe even made a friend there. At one point, we were drinking our BeerLao, waiting for our food and watching the tak-taks and flatbeds stream by with locals off to a Pi Mai party, when we spied a small convoy of Loop bikers ride by. Staying in an air-conditioned room with our baby and NGO-branded 4×4, I felt eerily distanced from their adventure. I wondered if it still in fact was the adventure that Lori and I experienced, or something more pedestrian and quaint. Only one way to find out! But first, we’ll have to survive a boat trip through a 7km (4.3mi) cave with a nine-month-old, first. Daddy, hurry & take the photo, l’m hungry and the food is here & I’m ready to eat now! Great posting, it’s neat to see the hills and remember our trip up north in January. Noe is always hungry, it seems! Glad you enjoyed the post and look forward to exploring more of the region with you guys in December! Hi from Aunt Jen. Can’t find Konglor on my maps. Sounds like a fun adventure.